The Energy Department published this image of a floating wind turbine online. You have to pay attention all the time or you miss important stories. One of the stories I missed this month was the announcement on May 8 that the federal Energy Department would pour $47 million into the construction of a floating wind farm off the Oregon Coast near Coos Bay. This will be the first on the West Coast, and the government is giving the same amounts each to two similar ventures on the East Coast. Governor Kitzhaber welcomed the funding for the Oregon project, the concept of which had been announced earlier. It is part of the campaign to make Oregon and the country less dependent on fossil fuels, mainly coal. The skeptical citizen still wonders, though, why we’re betting so much on wind power, which is expensive and intermittent, depending on the weather as it does. The wind farm off Coos Bay is being developed by Principle Power of Seattle. The site is 18 miles off the coast, invisible from land, in waters about 350 meters or more than 1,000 feet deep. 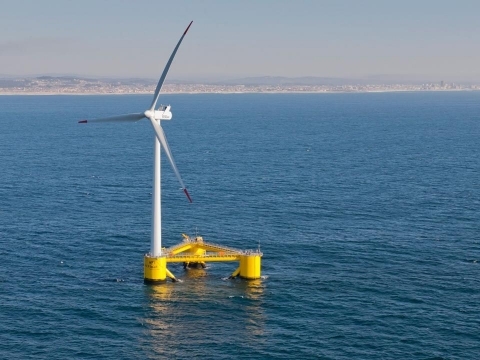 Principle and its partner, Deepwater Wind, plan to deploy five Siemens 6-megawatt direct-drive turbines held up by floating foundations and connect them to the grid on land. Why so far from land? The site is thought to be ideal for wind power. Also, though, each blade of the windmills will be one football field in length. Imagine such a gargantuan thing whipping around in a stiff breeze. (Eighteen revolutions per minute is typical for wind turbines.) Presumably there won’t be any marbled murrelets or other threatened seabirds getting in the way. Under the federal matching grant, the company has four years to complete what has been billed as a project to demonstrate the feasibility of deep-water wind farms off the West Coast. I trust that the Principle engineers know what they are doing. The company has operated an offshore wind farm in Portugal since 2011 and is building another one off the coast of Rhode Island. I wonder how many years it’ll take to produce $47 million worth of electricity? What kind of “carbon footprint” to construct and then to “service” them as needed. Are they going to “commute” to them by sailboat? Let’s call them “Birdburger Production Units” because that’s a better term fo describe what they’ll be doing mostly. Another good example of your tax dollars at work.